Astronauts aboard the International Space Station shouldn't be unduly affected by the failure of Russia's Progress 65 cargo mission on Dec. 1, 2016, NASA officials said. The six astronauts living aboard the International Space Station (ISS) will be OK despite a Russian cargo ship's failure to make it to orbit Thursday (Dec. 1), NASA officials said. The uncrewed Progress 65 freighter fell back to Earth shortly after liftoff Thursday, apparently doomed by a problem with the third stage of its Soyuz rocket. The spacecraft and its 2.6 tons (2.36 metric tons) of food, equipment and other supplies burned up in the atmosphere over southern Russia, Russian space officials said. "The Expedition 50 crew is safe aboard the station. 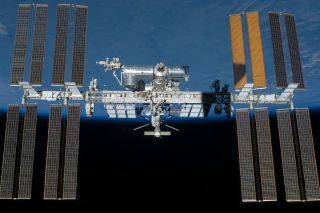 Consumables aboard the station are at good levels," NASA spokesman Dan Huot, of the agency's Johnson Space Center in Houston, told Space.com via email. The HTV is capable of carrying up to 6.6 tons (6 metric tons) of cargo up to the ISS. The Progress 65's lost payload included 1,400 lbs. (635 kilograms) of propellant, 112 lbs. (51 kg) of oxygen, 925 lbs. (420 kg) of water, and 2,750 lbs. (1,247 kg) of scientific gear, hardware and other supplies, NASA officials said. "Among the U.S. supplies on board were spare parts for the station’s environmental control and life support system, research hardware, crew supplies and crew clothing, all of which are replaceable," NASA officials wrote in an update Thursday. The six crewmembers aboard the ISS are NASA astronauts Shane Kimbrough (the Expedition 50 commander) and Peggy Whitson; cosmonauts Oleg Novitskiy, Andrei Borisenko and Sergey Ryzhikov; and Frenchman Thomas Pesquet. ISS crews have weathered cargo-mission failures before. A Cygnus was lost shortly after liftoff in October 2014 when its Antares rocket exploded, for example, and the Progress 59 vehicle didn't make it to the ISS after its April 2015 launch. And a SpaceX Falcon 9 rocket broke apart less than 3 minutes after launch in June 2015, scuttling a Dragon resupply run.